Thanks to new technology when a friend asks you what you did over the weekend, you may soon say “I stood 15 feet away from a dinosaur” – and you won’t be bluffing. On Friday Gear VR released their virtual reality headset developed by Samsung Electronics and Facebook’s Oculus VR for home consumption. The device, which looks like a boxy pair of goggles, gives consumers an early peek into the new immersive video technology that will begin stampeding into homes next year for the affordable price of $100. The Gear VR requires inserting a Samsung Galaxy smartphone into the headgear: The device relies on the smartphone’s screen for video and its computing brains for running apps and games. It is a precursor to the more powerful Oculus Rift, a headset that connects with a personal computer, which will make its debut next year. It is suspected that Gear VR’s virtual reality experience will be seductive for many because it is so fresh and different, but it will not become a regular activity because of the weaknesses of the headset. The technology needs to lose some weight, and the video quality needs to be clearer and easier on the eyes. It would also be ideal if the Gear VR worked with other types of smartphones, not just the newest Samsung Galaxy devices. It’s not reasonable to suspect that consumers would go out and buy a Samsung phone just to look at dinosaurs or lift giant stones with your head. 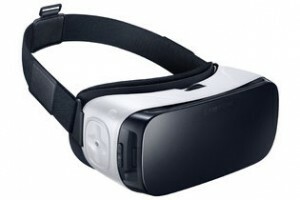 But the Gear VR would not be a bad holiday gift for people who already have a Samsung phone. Similar technology is currently being used in the business world and explained above continues to expand. It is a really great marketing tool in business, especially when marketing a service such as travel where you can place someone on the Panama Cannel to encourage them to book a trip there. This technology is an engaging way to sell globally because it isn’t restricted by language.